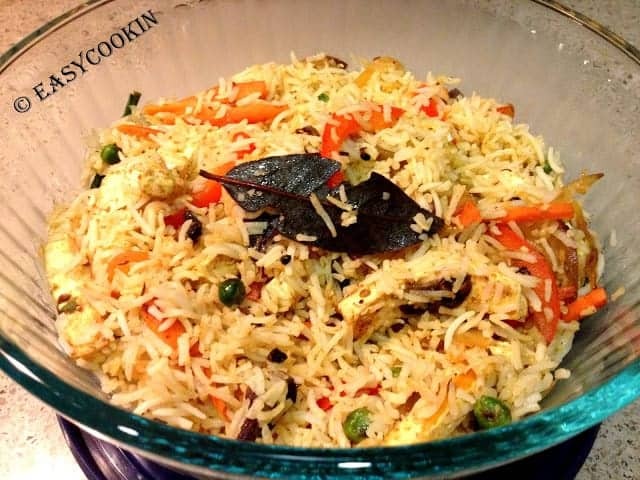 Indian Vegetable Fried Rice: absolutely easy and delicious recipe for a basic Indian vegetable fried rice. Perfect for packed lunches too. There are some days when we just don’t want to do anything especially cook anything at all. But the sad part is where I live, the only food that is home delivered is “Pizza”….now I’m not saying that its bad, but it does leave you with no other option. This is my recipe for one of those lazy days, quick, healthy and tasty ONE POT meal, almost feels like a Party in a Pot !!! In a large pot, add rice, water and boil on high heat, after 4-5 minutes, reduce heat, add ghee/butter, cover with lid and let it boil on lowest heat for 10 minutes. After 10 minutes, check few grains of rice and they should be almost cooked, now close the heat and drain water from the rice using a sieve. Keep aside. Heat 2 tbsp oil in a large nonstick pot on medium heat, add all the spices, sauté for 1-2min. Now add all the cut vegetables and sauté on medium heat for 3-4 minutes (to let vegetables cook a little). Take ½ of the cooked rice and mix in the sauteed vegetables, stir for 1 minute. Now add the remaining rice to the above and sauté everything together making sure vegetables and rice are mixed together. Saute on high heat for 2-3 minutes, thoroughly mixing everything together and then switch off the heat. No Replies to "Indian Vegetable Fried Rice"